I foresee this is going to be a long one, and therefore it will be a challenge to have it written it a way that it will not be too difficult to read through right to the end. I needed a day off, and it has to be a purely “off” day with no work, no reports, no calls, no anything work related. The team is so piled up with work we have been working through our noses. It is high time I took a real day off. My leave application was approved amidst the heavy load we are in and I am thankful for it. The day began in rote: I drove Calvin to school. I drove myself to my morning and breakfast spot. I ordered my usual long black, coffee shop version. I got my usual bowl of noodles. I got ready my notebook computer. I began to plan my day. 1. Take a 2 to 3-hour drive to Fraser’s Hill. Sit in a café. Have coffee and scones. Complete my Logos assignment. 2. Take an hour drive to STM in Seremban. Attend Chapel service. Have a catch-up time with Lee Yng. 3. Go for a 4-hour spa treatment. 4. Stay at home and do the usual. Now, what shall it be? Option 4 is definitely out of the picture! I cannot be vegetating at home. Option 1 is certainly tempting. It was on top of the list, except for one problem. I was working late into the night last night to complete all I had to do in order to have a truly free Thursday. As a result, I woke up this morning with a headache. What’s worse, it felt like an impending migraine. Option 1 will have to be for another time. I decided to combine Option 2 and 3 together. I will head off to Seremban at 9am, in time for STM's Chapel service at 11am. Head home at 3pm for a 4.30pm appointment at the spa. The morning was drizzling when I started. I used the KL-Seremban Highway. SH said that the trunk road will be congested will trucks and I will be better-off using the highway. However, I soon got quite bored. I decided I needed some adventure. At the Nilai interchange, I started on a should-I-or-should-I-not monologue argument. It went why-not and I turned off. The moment I got off the highway, I got energized. It was like getting into something of the unknown - I did not know where I was heading and where I will end up in. I will have to depend on my always dependable woman’s sixth sense. What happened? I drove on and on, made turns based on instinct – road signs are not very dependable, you see. The road swerved left and right, the vehicles in front became obstacles. Oh, I missed a turn. No choice - I had to carry on - the road is too narrow to make a three-point-turn back. Thankfully, I finally reached a broad intersection and did a U-turn. I actually got lost for quite awhile – I got into Seremban town and was reminded that it is a confusing town. I missed numerous turns due to useless and befuddling signboards. Soon enough I had to do another U-turn - since milestones indicated that I am heading back to Kuala Lumpur. I had to get back into the KL-Seremban Highway, and take the dependable Senawang interchange. I got back into the highway and took the Senawang interchange, but not without taking several calls from the office. I knew it would happen and there is nothing I can do to avoid it. Work will never leave you alone. I got to STM, parked my car at the far end of the compound. The place was fully parked with cars – there was a TEE class going on I was told. Reb was teaching Introduction to the Old Testament, the first TEE module I took way back in 2003. I got into the chapel with Lee Yng, who paid a visit to the doctor and was also late. Reb had already started on the reflection of the day. Kar Yong was seated at the back and we joined him. Surrounded I was, with scholars and students. Reb was giving a reflection on Psalm 62. I will have to say it sounded all too familiar since I have just attended his session on Interpreting the Old Testament not too long ago. 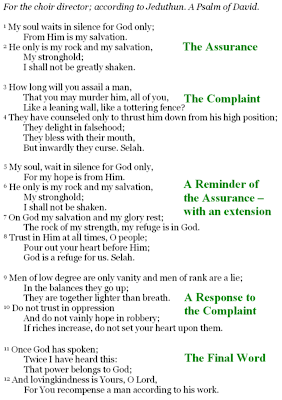 I took a close look at Psalm 62. God is indeed a refuge for us. After chapel, Lee Yng, Kar Yong, Lee Yng’s 2 friends from SUFES Melaka and I had lunch together. My headache that was lingering by now had gotten worse. We got back to STM after lunch. Lee Yng and I thought we could go out for a cup of coffee and a round of tête-à-tête, but first we headed off to her dorm room to get her medication. Yes, more pills. However, the moment I sat down on her bed, I have a feeling I will be glued there for quite awhile. Lee Yng made me coffee, we settled in and chatted to our heart’s content. We talked about church, ministry, mission, books, church, church, and church. We depressed ourselves with church. You know how it is when you talked about something you had been thinking about with someone you trusted, things gets clearer and your thoughts get confirmed? I was sharing with Lee Yng my recent experience of the pounding word from the Lord. Throughout 2007, I kept getting the mission-sermon. And unlike other times, I took these messages to heart. Is God trying to tell me something? But I am not a “mission person”! Even though evangelism is one of my responsibilities, I know it is not my specific calling. God then slowly revealed it to me – I do have a mission calling, whichever way it will take I have yet to find out, but I will have the second generation and beyond Christians to look into. This one is one hard one to crack. Soon, I realized I had to peel myself away from Lee Yng comfortable abode to get back on the road and head home. I have already missed the first appointment I made with the spa: I have decided to shorten the spa experience from 4 to 2 hours. The fellowship was more important. A full body massage is one of the most luxurious things in this world, and I got 2 hours of it. Kneaded, pressed, squeezed, pulled and rubbed. Mmm ... what more can I say? The spa I went to was a delightful place. Dim and quiet. Serene and still. It was however, too still for my mind's comfort. It was so discomforting, that in the midst of the kneading, my mind started to work. Oh no, it is not going to happen! I am not going to end a restful day working. I rummaged for my phone, plugged on the headphones and started on D.A. Carson’s session on John 3, “Jesus, the Gift of God.” It went on for an hour and 20 minutes. It was an excellent exposition. At several junctures however, he again repeated his usage of examples and illustrations. I have noted that he had done it before here he is doing it again. Is it a good thing to do? But I listened on, not wanting to think about anything other than the goodness of God. My body got kneaded, my mind got fed and my spirit got filled, I rested well. Alas, the end of an excellent day. It was a full day - restful and uplifting, refreshing and wonderful. Thank you, O Lord, my King and my God. Amen. Great picture of your relaxing day Pearlie! Yay for you and yay for God.